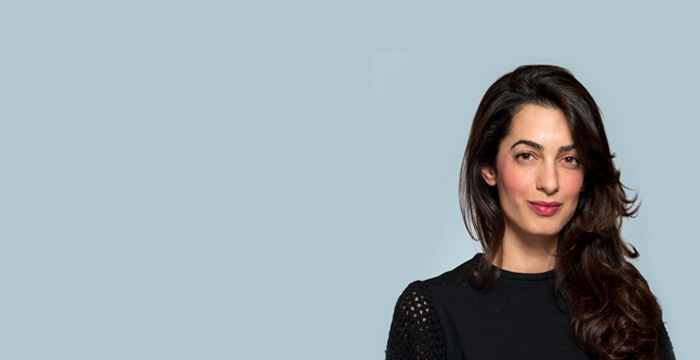 High-flying Doughty Street Chambers barrister Amal Clooney has been appointed by the UK government as special envoy to the Foreign and Commonwealth Office. In her latest role, the international human rights specialist will chair a panel of legal experts who will support countries to repeal “outdated and draconian laws” and “strengthen legal mechanisms” to protect journalists. Nearly 100 journalists were killed, 348 detained and 60 taken hostage by non-state groups in 2018 alone, according to the UK government. • Offering advice to governments who want to strengthen legal mechanisms to improve media freedom. • Supporting the repeal of outdated and draconian laws. • Encouraging and supporting governments to help ensure existing laws and international obligations are enforced. • Promoting best practice and model legislation to protect a vibrant free press. Earlier this year, Legal Cheek reported that a mystery law student had forked out a reported $8,100 (£6,140) to have lunch with Clooney at Jean-Georges, a two-Michelin-star French restaurant in New York. The meal was understood to be one of the items up for sale as part of an annual fundraiser hosted by Columbia Law School, the Ivy League institution where Clooney has been a visiting professor since 2015. “Clooney… will work on a pro-bono basis…”. So the post is remunerated at legal aid rates then. At least HM Govt is being consistent. Exactly! Is there a more dismal expression in public life than “Promoting best practice”? When you read that phrase, you just know that you are dealing with a quango that serves to serve the interests of those who sit on it. I demand that the persecution of journalists (that most pious and priestly of castes) cease at once! Journalists must be allowed to shill and spread neoliberal propaganda on behalf of the Open Society Foundation and US State Department unimpeded! Should we not get our house in order before gallivanting about promoting a ‘vibrant free press’? How is she high flying? Funny to think, lord sumption was a qc before he was 40, and that was his second career! Yes, well he was a real lawyer. No fake news there! He actually was a successful commercial barrister; before that he was a successful historian, with a PhD and a published book; all before he was 40; what has Amal done apart from Clooney lmao? This disgusts me. A shameless, self publicising, virtue signalling, little time barrister whose only real achievement is wooing an actor with a fading career landing this job?!. It is an unpaid job though. Is amal just clooney’s trophy wife with a makework job now? So why the hell is this IDIOT writer so quick to suggest its the recommendation of the Duchess. Bloody cheek ! Get a damn life you hater. Politically and strategically, her appointment makes total sense, and it’s likely no coincidence that this comes before Julian Assange’s arrest. Just find it ironic and interesting that her former client gets arrested today while she gets appointed as the PR face of “media freedom.” Why aren’t journalists asking Clooney about Julian Assange and media freedom? Yes, why aren’t journalists asking Clooney about Julian Assange and media freedom??? Just wanted to ask the same. Good point about Assange! Surely he needed the greatest humanitarian lawyer ever to walk the earth when he was arrested today! When he was a “cause celebre”, he was repeatedly used to bolster Clooney’s underwhelming CV, but she has now bought her way up thanks to her husband’s PR people, and so he is yesterday’s news. She makes £00,000 / year from that ‘role’.